Meta Editor 4.0 is here and is even more useful for professional photographers. This update leverages the IPTC editor and makes it an even more powerful tool. 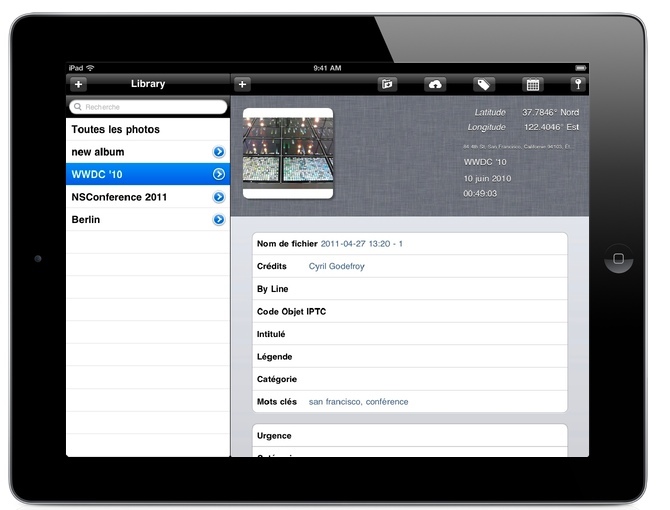 It is now also a universal app, working for both the iPhone & iPad. You can now sort your imported pictures into distinct albums, rather than the order number of the import. Of course, you can move them from album to album, and you have no limitation on the amount of albums. Searching your pictures by name, tag or title is still available and makes it easier to quickly find the file and photo you're looking for. All iptc fields are available for editing. The most common fields are all visible when you select an image, others are available too, beneath them. You can also select several pictures at once to set the info on all of them at once. Adding IPTC info on 20 pictures at once is easier than ever: open MEta Editor, choose these 20 images in your photo library, change to multiple mode and set the field you want. All EXIF fields are also available to read, so you can make the difference between two pictures if you need to, if you want to check the depth of field or other fields; Shortcut tools are available to allow you to make changes faster, respecting conventions for dates: a map allows you to edit or add geolocation of your pictures, or delete all geolocation info, a date chooser allows you to edit the date in an easier way. The tag list comes with a default thesaurus and you can edit and add your own tags. You can export in different ways the image you just changed: - by email if the image size is reasonable, - by FTP, with multiple servers recorded - through iTunes file sharing (open iTunes, plug your iPad and check the "Apps" tab), - and now using flickr. MetaEditor is probably the only tool that allows you to upload your picture to flickr with all metadata (even Flickr app doesn't do it). 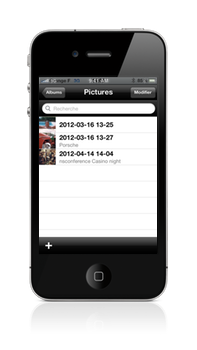 The FTP, flickr and iTunes file sharing are available in multiple pictures mode: export 30 pictures at once on the touch of a button. I spent a lot of time managing the best balance between quality of your image renderings on the iPad and performance. All previews are cached, making the browsing experience snappy and fast. The app now also contains a crash reporter to provide me with a better feedback on issues that may arise in real use (not tests). Please send me back the info anonymously so I can make it a better and more robust tool for you. I don't know if you think that your iPhone is a great camera, but I do. It's always in my pocket, for one, and the sensor is pretty decent in latest versions (though still far from my DSLR and 4/3 pocket camera). So I figured it was now time to add a universal version to the app so you can use on iPhone. 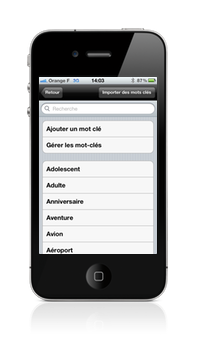 It is available on the Apple AppStore, and supports English and French.